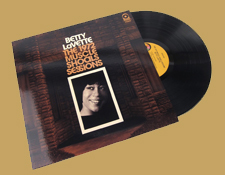 I hope that by now at least some of you out there in audiophile-land know at least some of the story about Betty LaVette's remarkable late career success story. Overlooked for decades after some early hits in the mid-1960s, Bettye toiled faithfully and in the 21st Century has achieved the success of which she'd always dreamed and deserved. She has released a wave of acclaimed albums and tours everywhere to spread the news of her renaissance. All of that is fantastic! Accordingly, this new first time vinyl issue of her lost 1972 album, recorded for Atco Records (a subsidiary of Atlantic Records) is a wonderful and painfully long overdue release -- back in the day it was apparently (and to Bettye, devastatingly) shelved more or less at the last minute just prior to release, for no immediate explicable reason. 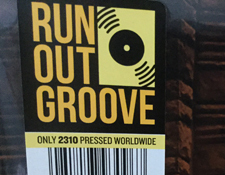 This new edition, marketed by the "Run Out Groove" imprint from Warner Music Group and manufactured by Rhino Entertainment, is something of a fan driven release. That is how the Run Out Groove concept works: fans vote on possible releases the label is considering and they get to vote on album cover options and such. Theoretically, participants get first dibs at the (usually limited edition) music via pre-order before it gets into stores. Its a smart concept. I participated in it this round and am happy that the laminated cover art style I voted for made the final cut! Anyhow, the music fares well and sounds mostly a lot better than the 2008 CD issue of this music (under the title Child Of The Seventies with different cover art and additional tracks). Not having an "original" pressing to compare this to, I can't really gauge whether this is true to the original (some tracks were issued as singles back in the day). At times I "think" I am hearing some side effects of some digital processing that likely was done along the way in creating this. But, again, not having any sort of original to compare this to I can't really comment on that with any certainty. Its not a deal breaker for me, that is for sure. The core album overall sounds full bodied and the music riveting, with Bettye's voice taking ownership of songs like "It Ain't Easy" (which you probably know from David Bowie's cover, originally written by Ron Davies). I was pleased that they decided to include Bettye's fabulous cover of Neil Young's "Heart of Gold" as a bonus track here (it was also a bonus track on the 2008 CD, recorded at a different studio / session during that period, so it sounds a little different than some of the other tracks). 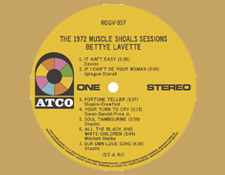 Most of this album, true to the title, was indeed recorded at the Muscle Shoals Studio in Alabama. That studio was a hotbed for a lot of classic rock and soul smash hits by artists ranging from The Rolling Stones to Paul Simon and Cher (and on up to more modern groups like The Black Keys!). So it made sense that parent company would want to have Bettye record there at this time, a period when Aretha Franklin was ascending to superstardom and other hit acts on the label were doing very well. "'Third tier' is an unfortunate term that best describes most of LaVette's 55-year career, despite her obvious talent. She had the misfortune of coming up during the same period as Soul Music's greatest stars. With competition like that, the best songs went to the Aretha's, the Glady's, the Mavis's and the Dionne's and, all too often, what Bettye got was the scraps." "Mark Meyerson, Atlantic's then-head of A&R recalls that, at the time the label 'had recent successes with Betty Wright and Jackie Moore and was putting a big push behind Margie Joseph and with superstars like Aretha and Roberta regularly delivering,' so there was no room for Bettye." Its no wonder (according to liner notes in the Child of the Seventies CD compilation) that Bettye spent "days in seclusion in Detroit 'under a table with a few bottles of wine'" after the album was shelved. Curiously, Margie Joseph and Jackie Moore are way less well known these days as far as I've been able to gauge, even when I've been talking with collectors of (so called) Northern Soul and Rhythm 'n Blues records from the 60s and 70s. Thank goodness Bettye persevered and is still here today to (hopefully) reap some benefit from this fine reissue! 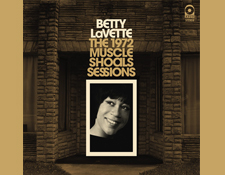 Anyhow..... Bettye LaVette's The 1972 Muscle Shoals Sessions is a fine release and if you are a fan you need to own this. Unfortunately, it is not up on Tidal but the earlier CD quality release, Child of The Seventies is so you can get there by clicking here. If you get a chance, go see her live. You won't be disappointed.